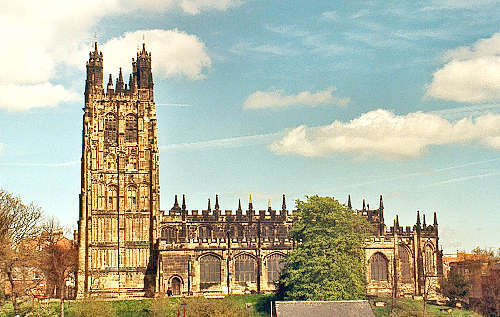 The ancient parish of Wrexham comprised the townships of Abenbury Fawr, Abenbury Fechan, Acton, Bersham, Bieston, Broughton, Brymbo, Borras Hwfa, Esclusham Above, Esclusham Below, Gourton, Minera, Stansty, Wrexham Abbot and Wrexham Regis. On 23 May 1844, the townships of Minera and Esclusham Above went to the new parish of Minera. On 6 December 1844, the township of Brymbo and part of the township of Broughton went to the new parish of Brymbo. In 1851, the township of Borras Hwfa was transferred to Gresford; and the townships of Erddig and Erlas were transferred from Gresford to Wrexham. In November 1851, part of the township of Stansty went to the new parish of Gwersyllt. In 1865, that part of the township of Bersham which lay west of Offa's Dyke was added to the parish of Minera. In 1879, the townships of Erddig, Esclusham Below, and a portion of Esclusham Above went to the new parish of Esclusham. In 1886, the townships of Acton, Bieston and Gourton went to the new parish of Rhosddu. On 15 February 1909, part of the township of Broughton went to the new parish of Broughton. On 7 May 1921, parts of the townships of Bersham and Stansty went to the new parish of Southsea. In 1934, further parts of the same townships went to the new parish of Bersham. The parish church is considered to be one of the finest mediaeval churches in Wales. It has close associations with Elihu Yale (benefactor of Yale University in New Haven, Connecticut) whose tomb lies not far from the tower. (A replica of the tower was built at Yale University about 80 years ago). An inscription on the tower states that it had been completed by 1506, but there is evidence that work continued for some time after that date. The tower is said to have been the inspiration for the Victoria Tower, Westminster in London. There is known to have been a church on the site since the thirteenth century, but the original church was destroyed by fire in 1463. It was rebuilt by 1472. The building was restored during the early years of the twentieth century. For family history information about the church and parish, visit the GenUKI Wrexham page.